1. Find the pink wood effect paper within the Simply Creative Shabby Chic 12x12 Paper pad and adhere with Dovecraft Perma Fix tape to the two front sections of your Dovecraft gatefold card. Carefully cut around each piece to get rid of the excess paper. 2. Die cut the pram from the First Edition Toys die set onto a pink sheet within the First Edition Textured Card Stock pad. Next, die cut the doll onto a coordinating sheet of Shabby Chic paper. 3. Adhere the pram with 3D foam squares to the left of your gatefold card. Place the doll in the pram to look as if it is peeping out and secure it with 3D foam squares. 4. Die cut the Happy Birthday Dovecraft die onto a pink sheet of First Edition Textured card stock. Stick this with glue, to the front of your gate fold card, on the top right corner. 5. Cut a piece of the wood effect paper from the Simply Creative Shabby chic paper pad to fit the inside of your gatefold card. 6. Next, cut two 1.8cmx 12.5cm strips of the same paper and adhere them with 3D foam pads to the inside of your card, one half way and one along the bottom to make shelves. 7. Die cut the doll house onto pink First Edition Textured card stock and the dice onto cream card stock. Layer each die cut onto a piece of A4 Dovecraft Silver Mirror card. Glue the house to the right of the top shelf. 8. Adhere one dice with glue to the bottom shelf and the other dice with 3D foam pads. 9. Die cut the roller skates and teddy bear from the First Edition Toy die set onto two different coloured sheets of First Edition Textured card stock. Use the left over sections from one to fill the other die cut in to add shading. 10. Lace through a length of Dovecraft twine on each roller skate to bring them to life! 11. Adhere one roller skate with glue to the front of the bottom shelf inside your card. Stick the second roller skate with 3D foam pads behind the shelf to create dimension. 12. Die cut the doll on cream First Edition Textured Card Stock and stick her and the teddy bear on the top shelf. 13. To finish, add a gold gem from the Dovecraft Christmas Basics collection on the front of each door, in the middle. This wardrobe design is truly wonderful and will be a real surprise to open. 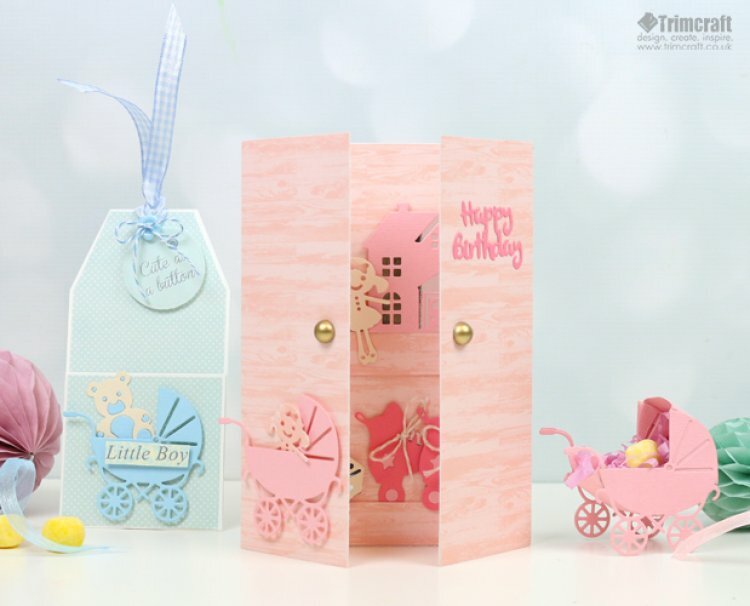 Maxine has also created this beautiful 3D pram using two pram die cuts and connected the two with pink First Edition Textured card stock. This would make a wonderful topper for a baby shower cake! Finish off a baby boy gift with this gorgeous tag! Maxine has used the First Edition It’s a Boy paper pad, decorated it with the pram and teddy bear die cuts and has made it with a little pocket so you can leave a hidden message! This fab First Edition Toy dies set is really diverse and will help you create the perfect present for a baby shower or for a little one’s birthday! We’d love to see your adorable crafts so remember to upload them to the project gallery and to #Trimcraft when uploading to social media.